What do we know about English Learners? English Learners (ELs) are one of the fastest-growing sub-groups among the school-aged population in the United States. The EL population is diverse due to differences in students’ exposure to English as well as individual competence in their first language. These differences, along with other social and environmental factors, influence each child’s ability to successfully learn to read and speak English. To best support ELs, educators must have a clear understanding of their students’ backgrounds, and must focus on providing personalized reading instruction, with varying levels of support. What are the instructional needs of English Learners? While these strategies should be considered essential for all learners, they are particularly important given the specific needs of English Learners. How does rigorous curriculum support the development of literacy skills for EL students? Rigorous EL instruction must address the development of oral language, reading, spelling, and writing skills in learners of all ability levels. Both the instructional design and the content design should utilize the above six strategies to support the development of literacy skills in English Learners. At the earliest skill levels, instruction should integrate basic foundational reading skills in phonological awareness and phonics with oral language skills. Since EL students are typically unfamiliar with the phonological structure of English, this kind of systematic, intensive work in the areas of phonological awareness teaches students the sound structure of English and allows them to build on this knowledge in the acquisition of phonic word attack strategies for reading. This awareness of sound structure also enhances the ability to recognize spoken words and allows EL students to experience greater benefit from vocabulary instruction. The development of vocabulary knowledge is fundamental to academic success for all students and poses a particular challenge for English Learners. Robust instruction that goes beyond word definitions and teaches word-learning strategies is critical for ELs to be able to access content and develop academic language necessary for following directions and understanding explanations. Instructional lessons designed to enhance vocabulary knowledge are often supported by pictures, which are particularly helpful for EL students in acquiring concrete words and concepts as well as more abstract academic vocabulary. 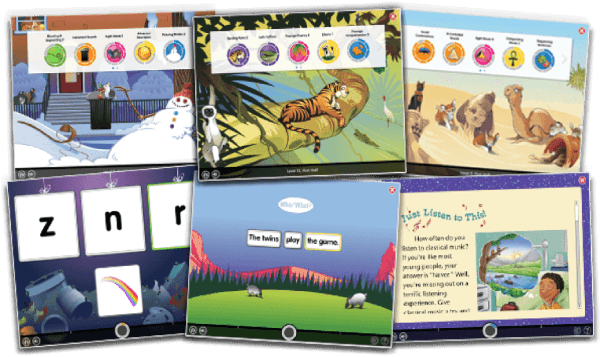 Students can strengthen their vocabulary knowledge through activities that focus on words with multiple meanings, analogies and shades of meaning as well as idiomatic expressions. Such activities are particularly valuable for EL students who may not have been exposed to this kind of figurative language. Exposure to Latin and Greek affix and root meanings develops an understanding of more sophisticated content specific words (e.g., inspection, photosynthesis). Work with the meaning of signal words (e.g., although, therefore) enhances knowledge of sentence structure to aid in both comprehension as well as writing skills. Along with a strong focus on vocabulary development, rigorous EL instruction often incorporates key comprehension strategies for listening and reading with both narrative and expository text. The systematic strategy of instruction requires active engagement with language and fosters the application of critical thinking skills. Instructional activities often incorporate the development of skills such as imaging and sequencing in both oral and written language and move to higher order thinking skills such as determining the main idea, drawing inferences, predicting outcomes and summarizing. This focus on the comprehension process is particularly important for ELs to help them identify and repair breakdowns in comprehension as they read. A focus on monitoring of meaning across content areas enhances the student’s ability to generalize these strategies to new and unfamiliar settings and contexts. Many ELs struggle with reading fluency which might appear, at first, to be due to struggles with word recognition (phonological awareness and phonics). However, in many cases these struggles are often due to weaknesses in vocabulary, knowledge of sentence structure and phrasing, and insufficient exposure to print. English Learners in print-rich environments benefit from early exposure to reading and print concepts such as familiarity with letters and sounds, as well as exposure to the conventions of printed words (e.g., reading left to right on a page and front to back in a book). Additionally, a focus on fluency instruction should be incorporated in classroom activities that focus on word identification, vocabulary knowledge and sentence structure related to phrasal chunking and prosody. Paragraph level fluency activities can also help to increase speed of processing while maintaining a focus on meaning. As students encounter unfamiliar words in text, their speed and accuracy of reading will decrease and comprehension will suffer. To combat this, ELs require good reader-text matching with opportunities for structured and purposeful, independent reading. Independent text should be easy for students to understand and requires little or no support from the teacher. When there is good reader-text match, students avoid struggling with concepts that they have not yet mastered and are able to successfully practice newly acquired reading skills. Since there are distinctly different types of texts for reading instruction, not only must teachers take into account the text’s complexity and difficulty, they must also consider the instructional purpose of the selected text. While engagement in deep reading activities is critical for EL students, it is equally important for them to have the opportunity to participate in structured, academic talk. Using appropriate academic language through teacher-led instruction and dialogue as well as structured peer discussions helps ELs build speaking and listening skills. These skills help ELs further develop reasoning skills and deepen their understanding of content. ELs benefit from modeling to hear language in authentic and varied contexts and structured, academic talk provides the opportunities to practice grammar and vocabulary to strengthen oral communication. Using these instructional best practices, students will engage with the rich language used in their classroom instruction, and will develop the foundation and building blocks critical for academic success by strengthening and integrating their oral and written language skills. *Francis, D. J., Rivera, M., Lesaux, N., Kieffer, M., and Rivera, H. (2006). Practical guidelines for the education of English Learners: Research-based recommendations for instruction and academic interventions. Center on Instruction.